Neo-classical music and minimalistic explorations always had a point of convergence. Minimal electronic applications found their way into classical orchestrations, expanding the sound of the orchestra, as well as the emotional scope of the composer. Max Richter is a proud example of this tradition, a composer who has learned as much from Philip Glass and Steve Reich, as he has from Brian Eno and LaMonte Young. Probably the recordings that Richter is most famous for is Sleep, an eight and a half hours of music aimed as a sleep aid, where the composer researched in depth the neuroscience of sleep. The record was deeply experimental, dwelling into drone and ambient areas, moving through minimalistic means. As adventurous as Sleep was, Richter has shown that off-kilter studies are as important to him as classical, and neo-classical methods. Just listen to his excellent renditions of Vivaldi, Recomposed by Max Richter: Vivaldi – The Four Seasons, to get a glimpse of this side. His new record, Three Worlds is an ambitious work, just given its scope. The “three worlds” to be explored are none other than three colossal works of Virginia Woolf, Mrs Dalloway, Orlando and The Waves. 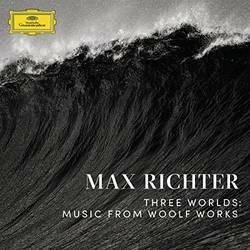 Richter's music was previously used for Wayne McGregor's award winning Royal Ballet production, Woolf Works, which is not surprising given the composer's aptitude in crafting soundtracks. His numerous work on that medium have included Waltz with Bashir, Womb and Wadjda as well as TV series such as The Leftovers, Black Mirror and Taboo. Moving from a visual medium and attempting to get the music to stand by itself can be a challenge, but it is a task that Richter happily takes on. The structure of Three Worlds and Richter's progression through the individual tracks and parts is the strongest aspect of this journey. The work is introduced by Woolf's famous, and only surviving, broadcast “Words Fail Me,” granting a poignant start to the record, and providing a platform where Richter's music can aid in expressing the emotion of these very words. Mrs Dalloway is comprised of four parts, where Richter explores the space through his neo-classical kaleidoscope, remaining conservative in his use of electronics, producing epic melodies, filled with emotion and power. The final story is presented in a single, twenty-minute long instance, which begins with Gillian Anderson's narration of Woolf's suicide note, addressed to her husband. The track is built with glacial place, separating itself from both the neo-classical form of Mrs Dalloway and the electronic-infused injections of Orlando, focusing on the construction of ambiance and sceneries. The striking conclusion is that as diverse these worlds are, and Woolf's books are that diverse, Richter maintains common threads, which run on an emotional, subliminal level through all three parts of the record, bridging them together, creating a cohesive long-form story, filled with wonder. Posted April 10, 2017, 5:50 p.m.